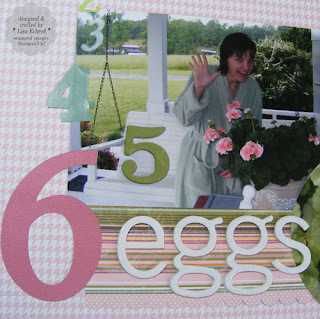 Lisa E Design Blog: 1-2-3-4-5-6 Eggs! Every day last May we checked the nest in the geranium in front of the kitchen window. Once the eggs started, our little birdie left another each day. I couldn't believe it when we were up to 5 but finally 6 was the grand total. Lenny and I had been debating how we were going to keep Jasper away from those birds. He hops up right beside the geranium to look in the kitchen window. It is his signal to us that he wants in the house. He never paid any attention to the nest even when the mother bird was on it. Chirping little birdies would have been another story. Mother bird sat on the nest for a couple more days after all the eggs came and then abandoned it. It solved our dilema but we hated that they didn't hatch. 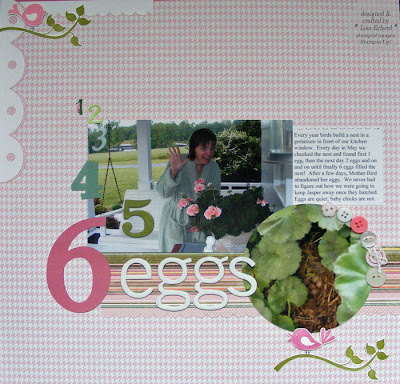 This layout features several papers from the Sweep Pea Designer Series Paper in Stampin' Up! 's mini catalog. The colors were perfect for these photos. I used assorted stickers for the numbers up to 5 which is chipboard and the "6" I cut on the Cricut out of more of that DSP. 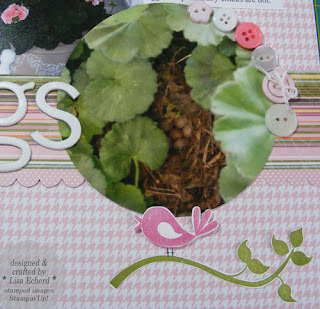 The little birds are stamped using the Cheep Talk stamp set. A fun layout for a fun few days of discovery. 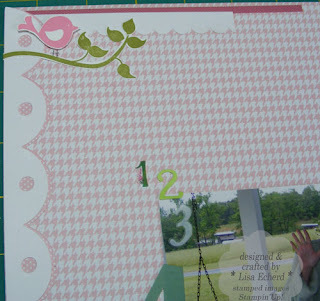 Ingredients: Stamps: Cheep Talk by Stampin' Up! Ink: Rouge by Colorbox; Old Olive, Ruby Red by SU! DSP: Sweep Pea by SU! Buttons: Various sources including some Pink Piroette from SU! What a wonderful page and pictures. Love how you did the count/numbers of eggs. And I was wondering if you know what makes a mommy bird abandon her nest? We had the same thing happen to us last year. It was so sad and disappointing... I was thinking that perhaps something had happened to her while she was out getting a worm or two?? Will have to see if she returns this year. We have left the nest unharmed protected under our porches eaves. Susan, we don't know for sure what happened to our Momma bird. She could have been scared off by the cat but he really hadn't noticed her at all as far as we could see. I wish I had a way of knowing if it is the same bird that comes back to nest in a geranium each year. This was the first with so many eggs.